Waterfront Home with a Beautiful Beach, Sleeps Comfortable 10 Person in Beds. Tyne Valley pulls up because of Google Maps. I have uploaded images of Bayside and Tyne Valley. We are located in Bayside but just a short drive or bike ride To Tyne. We will upload a video of renovations! I wanted to explain NO Photos of Property. We have purchased this Home and are going through a make over, its going to be beautiful, cottage comfort. For anyone that would like to send me your inquiry, I will notify you when the pictures go up for viewing. We have pushed back our Grand Opening Season till June of 2020. Bicycle Rentals for Free and a $250.00 Gift Cert. I would have to make adjustments before you book! Please send inquiry, thank you!!!! Our New Cottage Home is centrally located for ease of travelling the Island. We are located on the water with a beautiful beach that surrounds the bay of Bayside Richmond County. Only 15 minutes from Summerside which would have everything you would need to stock up… on your way out. Car rental is a must as we are an hour from the Airport right in the middle of cottage country. The airport is located in Charlottetown or you can fly into Moncton N.B. and cross the 16 mile bridge on your way over to the Island. Travel from three locations and this link will guide you on a venture of your choice! 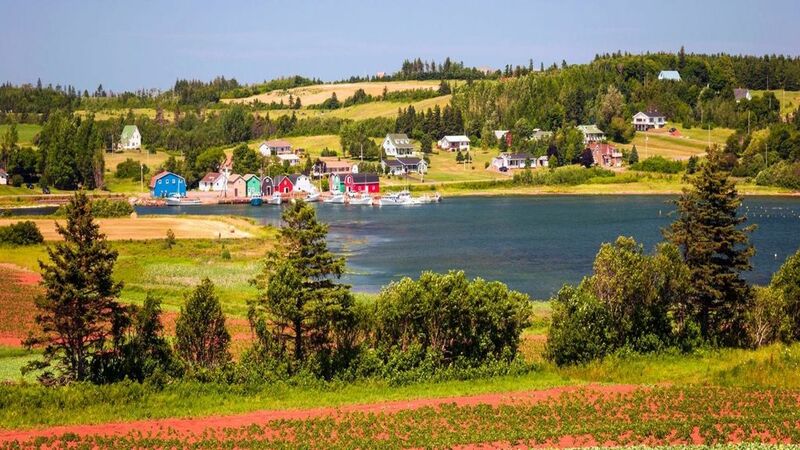 You can choose to take an outing to Wood Islands which is a rural farming and fishing community located in southeastern Queens County, Prince Edward Island on the Northumberland Strait. The drive is spectacular with many rolling hills, beautiful old century homes, villages and churches. PEI has so much history and has that spectacular flare of the East Coast. Below I have listed a few links to help with exploring the Island. Obviously surrounded by the ocean, it is… a beautiful sight to see and experience! For the golfers, it’s a dream. If you want to deep sea fish, this is the place. Stay home and live the cottage life, enjoy …lol…hmm… big fire-pit with plenty of stacked wood, a hammock and porch swing. I’m on the search for an Iron Kettle. Our home has three floors, one floor with 2 large bedrooms. The first bedroom comes with a Four Poster Queen Bed with Pillow top for comfort along with two side tables, dresser and TV. The other bedroom is quite large and fits comfortably a Rod Iron Queen Bed with Pillow top, side tables, vintage dresser, a set of Platform Twin Beds with topper, plenty of drawers and TV. This floor also has a 4 piece bath with soaker tub, shower, double vanity, Sauna and washer/dryer. There is a small office with a vintage desk and banker’s chair. The main floor has a Master, Mission Style Slat Bed with Queen Pillow top mattress, matching side table, a high boy dresser with seating and a large closet. Directly across a three piece bath, 72” double vanity, large walk-in shower, built-in bench and rainfall heads. There is also a main floor stack-able washer/dryer. The living area spans across the front of the house with many windows to take in the view! The open concept has a fully equipped kitchen, pantry, bar and an island/eating area, dining area, a living space with fireplace & fireside chairs. Enjoy the walk-out deck to a barbecue and seating area with a Beautiful View! The open concept Loft overlooks the water with a balcony, built-in bar, bistro table with an area to hang out, play cards, board games and a 55 inch Smart TV with large sectional and seating for everyone to gather and watch a movie with popcorn. Tucked away with privacy is a Queen Loft Bed, side table with armoire and custom dressers. The loft level has a 3 piece bathroom with shower and double vanity. Outside entertainment area has a large fire-pit with an Iron Kettle to indulge cooking fresh seafood. There are plenty of Adirondack chairs for sitting around the fire. We have horse shoe pits, setting up a volleyball net w/ball, rackets w/birdies, yard games & beach toys. On the main floor deck sits a new barbecue with accessories and spit for roasting. The lounge area steps down to a large patio with walkway to enjoy the fire-pit and just steps to the beach. Supplied are all linens, pillows, towel sets, paper goods & A Stocked Pantry! Tip the pantry jar, It will keep the Pantry full for others convenience. Beach towels are not included….! Sleeps 10 Comfortable with 3 bedrooms and a Loft makes 4 bedrooms with three full bathrooms! There is also 2 pull-out to sleep 4, for a total of fourteen persons, if needed. Minimum Booking, 7 Nights, 10 Nights & 14 Nights Longer Stays are Welcome! Rates are $1925.00 per week of 7 Nights. Included when booking for 10 nights or greater! A fee of $500.00 for damage deposit, refunded after cleaning is complete. A set cleaning fee of $200.00 cash due upon arrival, no exceptions, sorry! Full Refund for cancellation 60 days prior to arrival & 50% refunded prior to 30 days. Our home is located in Bayside, a 15 minute drive to Summerside. Summerside is a Canadian city in Prince County, Prince Edward Island. It is the second largest city in the province and the primary service center for the western part of the island. Here you can enjoy an afternoon of numerous attractions! Cavendish is 45 minutes away for a day excursion. It’s a hub for touristy things to do. Cavendish is a resort area on the northern shore of Prince Edward Island, in Canada. It’s known for the beaches and cultural sites of Prince Edward Island National Park and Green Gables Heritage Place. The island is a beautiful place to vacation with family and friends. Here is a link to help absorb some of what PEI has to offer. We open our doors on June 28/10 this summer….!!! Wish us luck!!! I want to thank of all you who took the time to write a review on my previous property in Wine Country along Lake Erie. (60* 5 stars reviews*). I'm made Premier Partner! Since this is a new property we certainly would appreciate any feedback and especially Reviews! Hi We are Sandy & Gord We met a year ago and have not wasted anytime moving forward. Gord is semi -retired and I'm going to enjoy having fun with this beautiful Cottage Home.....We are going to take time and travel while camping in different areas of PEI and the East Coast. Its very new to me, I come from the most Southern Tip of Ontario. When Gord was young his family spent many years camping PEI. He retired from 33 years RCMP and works in Security for Oil & Gas. I had a previous Vacation Guest House in Wine Country along Lake Erie. We are looking forward to sharing our home with good standing Guests....& New Customers! We have purchased a travel home to live in during new renovations and some decor upgrades with warmth and that will allow us to discover places off the beaten path to share with you, our guests. Explore the History of PEI and enjoy the funny & quiet moments when spending time with good friends and family at our Cottage Home! Our home is located in Bayside with views that surround the Bay. Our Cottage Home setting feels like the early years of cottaging. Please inquire about the use of our aluminum fishing boat, row out and drop your line. The beach is the perfect place to make sand castles and a great fire to watch the sunset. There's a couple small villages just a short drive away and Tyne Valley is just a 8-10 minutes with restaurants & shops. Summerside is located just 15 minutes away with coffee shops, boutiques, waterfront theater and so much more. PEI runs on its own clock so take time to live the life in Prince Edward Island. Water Views, sandy beaches, fishing, walking, riding bicycles for fun adventures. We have 3 floors with 4 bedrooms and three full bathrooms. We have 4 queen beds and a pair of twin beds with Laundry on main and lower level. There's also a Sauna and a soaker tub in the lower bathroom. A Loft with balcony, a built-in bar and plenty of room to gather and watch movies or play board games.... The entertainment area outside with fire-pit is perfectly situated for that sunset view. A beautiful cottage home for large enough gathering of friends and family. Close to all amenities and far enough away for those quiet moments of cottage life. Three Full Bathrooms / Three Floors The first floor is done with vintage tiles and rustic pieces. The Main Bathroom has a gorgeous rustic double vanity with an edgy tile and walk-in shower w/rain head and hand held. Stack-able washer & dryer. A bench for ease of dressing and a long-gated toilet. Black finishes! Loft Floor has a custom shower, two separate vanities and bronze finishes with great lighting. Home is located on the corner of Killbride and Lornes Lane in Bayside Richmond County. Beautiful Beach views of the bay that wraps around the grand river that leads out to the ocean. The Cottage home sits on the corner lot with a full access property with pathway to the beach. This complete walk is 20-30 feet from the deck! The Bays continually move towards Northumberland Strait. Its a beautiful sunset! The water views are right there, perfect! Fireplace indoor seating area in the open concept at the front of the house. PEI Internet ? Bell ? White cotton towel sets and plenty! Beach Towels are not supplied make sure to bring a beach towel. Outdoor rope to hang beach towels. 1 Elliptical, work bench with weights, TV & Fridge - Outdoor Shower - coming from the beach or work out from a brisk walk along the beach or bike ride on a Mountain bike. Please inquire ? Full large Fridge with half freezer along with pantry storage! Coffee Bar & Tea pods - Folgers grounds with Coffee Pot and Filters If you would like to bring your own absolutely! Full Pantry from flower, sugar w/b many seasonings with oils corn, olive,vegetable Diane's, Sauce , lemon limes, onions, ketchup, relish, mustard, honey. Tip the Pantry Jar ! it all moves forward ! Open concept Kitchen with an island for 4, Bistro set for 2 and a dining table to seat everyone along with a hang out area with a Fireplace while you overlook the water. Inside Open Concept Kitchen, island, dining and seating area by fireplace would definitely seat 16. Dining together would be 10. All windows with Water Views. Outdoor entertainment area & fire-pit. Bose Stereo and speaker, please bring your music and plug in. Walk out on the deck from Kitchen/Open concept area. Walk down to an entertainment patio, just a few steps to the large fire-pit surrounded with Adirondack chairs. Many golf courses an some of the top 10!